When you read and review a LOT of books, the temptation is sometimes to read through the book with the eye of all the things you can say that are right and potentially wrong with the story. It’s hard to remember that I read to be entertained…and reviewing with a critical eye should be secondary to that. Kaje Harper’s stories make me forget that there’s this blog and a review to be written. I find myself immersed in her stories and her characters…I don’t look at it as bits to be scrutinzed but as a complete picture I’m watching being filled. I’m so rarely not entertained by a Harper book. “The Family We Make” is no exception. This is the follow up to her novella, “The Family We’re Born With” (which I loved) and it picks up right where that one left off. These books are about FAMILY…so yes, they’re emotional and heavy and not always pretty and yet harmwarmingly faithful...and tugged at all my heartstrings. Book 2 is about Rick (Clint), who we briefly hear about in the first book. Rick has run away from home and is living on the streets after not being accepted by his family for being gay. He’s found by his brother, Sam (who is quite frankly, this RIDICULOUSLY yummy, upstanding, amazing man…) and the two of them figure out how to keep their make-shift family together and safe. Rick meets Travis, a semi-closeted young man forced to move back home from college due to financial reasons and we get to read about their blossoming romance. There’s also a myriad of other side characters that contribute important parts to the picture. This book is part NA love story (Rick’s and Travis’)…but not the only part. As I mentioned, there are lots of additional characters and intertwined relationships that contribute to what makes this story so robust. And though I DO LOVE the Rick and Travis story (how adorable is Travis…urgh…love that kid! ), I love the growth and progression of ALL the various relationships in the book. And I LOVED getting more of Jesse and Devon from book 1. 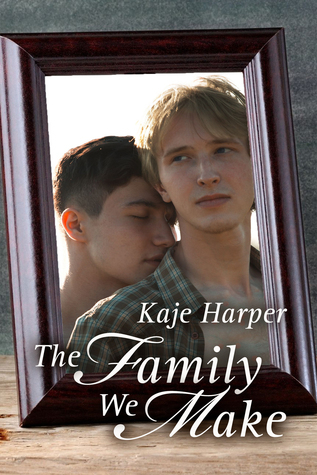 The book is about love, acceptance, making a LIFE worth living…and yes, FAMILY. There is some tough content and sensitive subject-matter, but what really impressed me was that these were handled head-on. The author writes with such…COURAGE…to tackle these difficult topics and there was an authenticity to that. The word “BRAVE” comes to mind when I think of how these characters face life…but not in this in-your-face way, but very subtlely…in a way that draws the reader in and makes them not want to be anywhere else but immersed in this story. The book did feel a bit long at times and there were a couple story-points I wasn’t sure needed to be included (the Dora bits didn’t do much for me personally). But this didn’t distract or take away from my enjoyment of the book. It’s a powerful and heartfelt read…definitely recommended! I read this book over the weekend and I really loved it. I can’t wait for another installment in this series. This entry was posted on August 19, 2014 by BioB in Contemporary, Reviewer: Susan and tagged 4 Stars, kaje harper, self-pub.